I hope you and yours had a thankful and filling Thanksgiving Holiday! My Thanksgiving started with participating in the Oak Hills Turkey Trot! It was not only my first race (although I am pretty sure I placed last), but it was the first time I had even run 5 miles! I ran with Jill who kept my spirits and pace up. We also participated in the Trot with Kayla and Brian. My PR for 5 miles is now 55 minutes, which is crazy because when I did a practice run with Kayla last Saturday, our time was 55 minutes. That means that my mile times were faster now than they were a week go! After the race I took a brief rest, a shower, and then it was time to get to work on Thanksgiving dinner! I always have that internal struggle of what kind of potatoes I want at Thanksgiving: sweet potatoes or mashed regular potatoes. ARGH. This year we got really lucky, as a friend of Ktam’s parents had made too much mashed potatoes for her Thanksgiving dinner and gave a couple servings to us! It was the best of both worlds, and I stuffed myself like there was no tomorrow. All of that said, our Thanksgiving was extremely fun and functional. We had a 13lb turkey that fed 9 hungry tummies with left overs, and 2 pumpkin pies (one pumpkin and one pumpkin chiffon). After dessert we were due to join Jenni for a festive second Thanksgiving, but my race was catching up with me. It was time to go home to rest up and ice my right knee, which was buggin’ me somethin’ awful. And since I know YOU probably have a long weekend, it’s time for a cooking project. 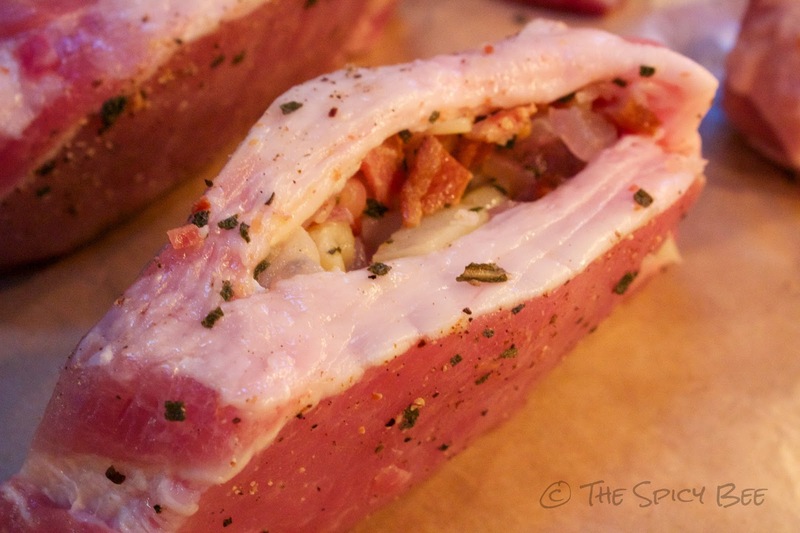 If you’re still brave enough to get out to your grill, this recipe for apple & bacon stuffed pork chops is a huge crowd pleaser, and it’s quite simple to put together! To start, prepare your bacon. I like to cook ours in the oven; 15-20 minutes at 400°F until crisp. Make sure to reserve your bacon grease. In a medium pan (I recommend a cast iron skillet or dutch oven), melt bacon grease over medium-high heat. 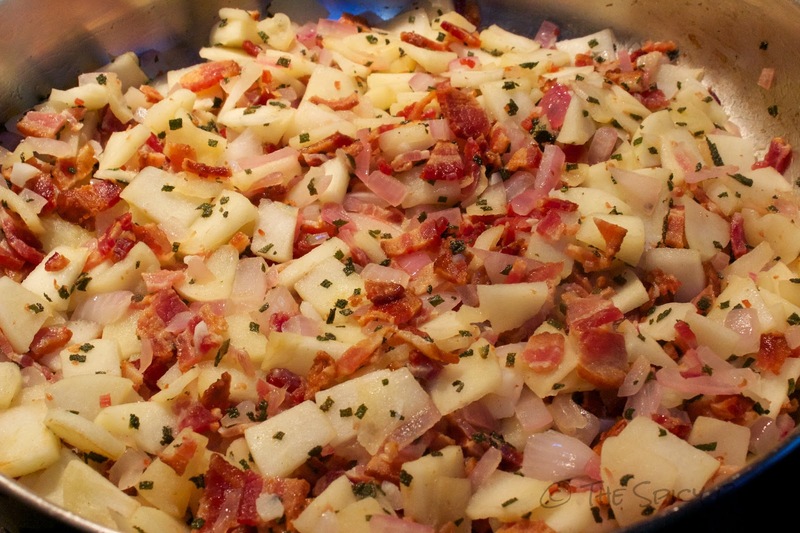 Cook the apples, bacon, and onion until onion is softened, about 8 minutes. Then add garlic, sage, paprika, and lemon juice and toss for 2 minutes. Remove the stuffing from heat, transfer it to bowl, and set-aside. There are two different ways to pocket your pork chops. You can either ask your butcher to “pocket” your baking chops for you or you can do it yourself. Using a 4-6″ knife, pierce the fatty side of the chop, and wiggle your knife side to side until your “pocket” is about 5″ long and 3″ wide (70% of the chop). 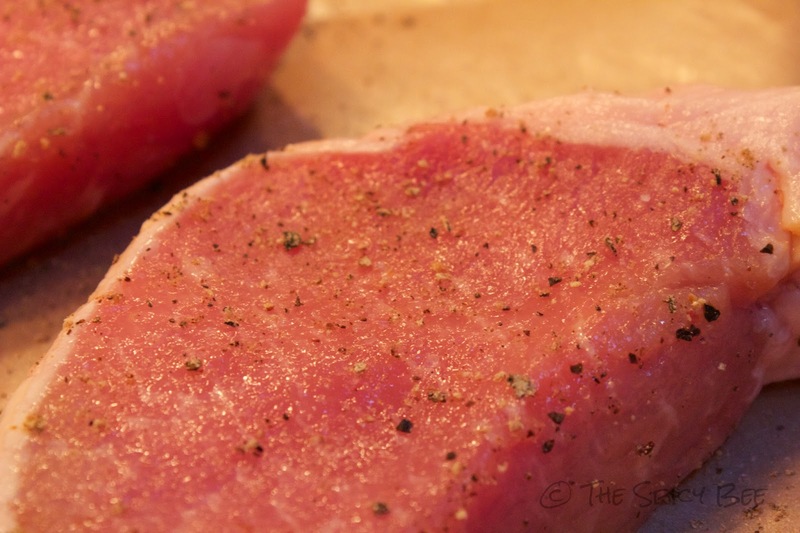 Salt and pepper each side of pork chop, Stuff it with as much stuffing as you can fit, and use toothpicks to close. This will prevent spilling (about half of the stuffing should be leftover). Grill the chops direct for 3 minutes on each side; Then transfer to the other side of grill and continue cooking on indirect heat until they reach 145°F internally. How do you like stuffed pork chops? Let me know in the comments! I’ve been meaning to try some stuffed with goat cheese, figs, and chives. YUM. Hooray for rocking the race! I’ve never had stuffed pork chops but have always wanted to try stuffing something! I’ve never made stuffed pork chops. Now it is going to be a must make. Congrats on the race, I’m so impressed with your time! Never stuffed pork chops before, but I have flattened them and rolled stuff up in them. This looks good though, pork in pork is my kind of dinner!